Kerala's 38,863 km� (1.18% of India's landmass) are wedged between the Arabian Sea to the west and the Western Ghats to the east. Kerala's coast runs some 580 km in length, while the state itself varies between 35-120 km in width. Geologically, pre-Cambrian and Pleistocene formations comprise the bulk of Kerala's terrain. The topography consists of a hot and wet coastal plain gradually rising in elevation to the high hills and mountains of the Western Ghats. 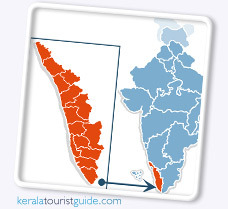 Kerala lies between north latitudes 8�18' and 12�48' and east longitudes 74�52' and 72�22'.